Oh man are these sliders delicious!!!! Everyone devoured them, and asked for more! I love finding new recipes that everyone enjoys. Yay!! 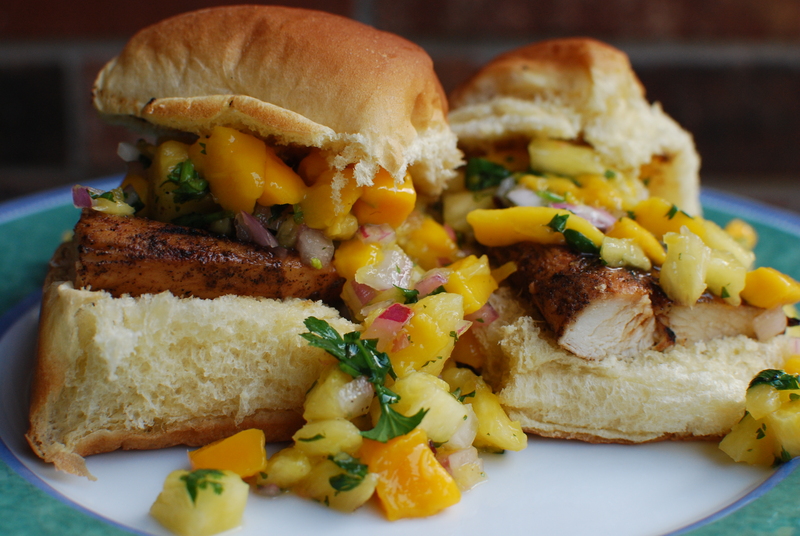 We’ve made these with the pineapple mango salsa (recipe below), with the pineapple salsa (recipe below minus the mango), and with just the mango salsa (recipe below minus the pineapple). Use what you have on hand or what you like best. It’s all good! Mix the Jamaican Jerk Sauce ingredients until smooth. Place the sauce in a large Ziploc bag and then add the chicken. Marinate for at least 30 minutes or overnight. Grill the chicken; then cut each breast in half (or smaller, if necessary). Slice each roll in half, place chicken on roll then top with Pineapple Salsa.